The worst time to see a museum is in the weeks when it’s just opening. That’s why, for the moment, I’ve opted to stay away from the Barnes Foundation’s new building in downtown Philadelphia, designed by Tod Williams and Billie Tsien. In the days before the public arrives, critics experience a totally artificial environment—a museum without museumgoers. When the doors are finally opened to the public, the mood in the galleries is likely to be so keyed up that it’s impossible to have a sense of what the place will feel like six months—or two years—later. 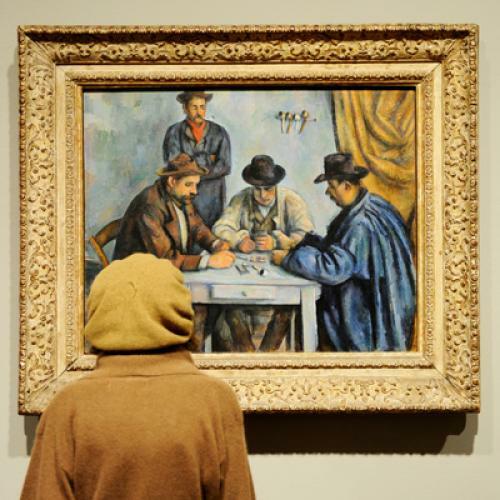 And the new Barnes Foundation poses special challenges, to say the very least. The opening of this building is nothing less than an art world Judgment Day, because the move from suburban Merion, Pennsylvania to central Philadelphia comes only after a brutal, decade-long battle to break with the founder’s wishes, a battle that went on in the courts and the media and even inspired a feature film. Am I surprised that the press reports I’ve read so far suggest that Judgment Day is turning out to be any old day, that many critics are saying there is no need to worry, that all is right in the world? Not at all. The new Barnes is now a fact on the ground, and few are willing to challenge the status quo, even a freshly hatched status quo. But for the moment I prefer not to pass judgment. I will visit—but in a while, after the hoopla has died down. What I did find myself doing over the past several days was pulling from the shelf a couple of the big books written in the 1920s and 1930s by Albert C. Barnes, the man who built this transcendent collection of Cézanne, Renoir, Seurat, Matisse, and Picasso. They’re amazing books—often written in collaboration with the Foundation’s curator, Violette de Mazia—monuments in the battle to make modern art a reality in America in the second quarter of the twentieth century. They are also not easy books to love, at least not at first glance, what with their bulky formats, poor production values, and chapters and subchapters marshaled as if in preparation for some standardized test. They’re ugly to hold; you may feel they’re best left in some dusty back room of a university library. But when I begin to read I am astonished. The Art of Painting and The Art of Renoir have a blunt, evangelical force; they’re textbooks dedicated to transcendent values, written at a time when Barnes, a friend and disciple of John Dewey, believed that an appreciation for art could really change a person’s life. Barnes was a self-made millionaire who had developed Argyrol, which in the early twentieth century was critical in fighting gonorrhea and gonorrheal blindness in infants. In the 1920s, buying from the key Parisian dealers in avant-garde art, he built a collection perhaps second to none in the world, and valued today, if the auction houses could only get their hands on it, at something like twenty-five billion dollars. Barnes was complex and quirky, a proletarian millionaire intellectual who welcomed working people to his foundation but enjoyed turning eminent scholars away. He saw his pictures as sublime experiences and pedagogical tools—and in his writings the sublimity and the pedagogy are fascinatingly mixed. Barnes was an apostle of formal values, pressing the American public to understand paintings not in terms of narrative and representation but in terms of the power of color and composition to provoke feeling and meaning. He had some of the pigheadedness of the autodidact, and in his writing he could be a bit of a bore—a modern pedant in the nearly hundred-page-long appendix to The Art of Painting, where he repeats over and over again more or less the same rather arid analyses of triangular or rectilinear structures, linear patterns, and color harmonies. But the more of Barnes you read, the more you will discover a formalism of rare power—an exploration of the many ways in which formal values reflect and refract the full range of human values. “Coherence,” he writes, “means no mere sameness but sameness in difference: not the unity of grains of sand, but of parts of an organism which complement each other but are not all cast in the same mold.” “The abiding appeal of art,” he announces in the Renoir book, “springs from the presence in it of the characteristics which lend interest and poignancy to life itself: movement, contrast, rhythm, symmetry, coherence of parts, unity of form and meaning, and individuality of purpose.” A thorough analysis of Barnes’s writings would locate them in the broader movement to bring modern art to American audiences in the 1920s and 1930s—a movement that frequently had a missionary zeal. The actors in this great drama did not necessarily see eye to eye, and indeed they were at loggerheads about many things. But there are surely echoes and affinities between the writing and thinking promoted by Alfred H. Barr Jr. at the Museum of Modern Art, by Albert Gallatin with the publications of his Gallery of Living Art at New York University, by Duncan Phillips through the Phillips Collection and books such as his 1937 The Leadership of Giorgione, and by John Graham (who exhibited at the Phillips Collection) with his eccentric underground classic, System and Dialectics of Art. Much of the confusion and ambiguity in the use of the word form has resulted from ignoring the obvious fact that no object or situation has one form and only one form. A man may be French, a Jew, an engineer, a thief, a celibate; New York is a city, a financial center, a harbor; in each case the man’s or the city’s form varies according to the grouping of relations which determine each category, and no single form represents either the man or the city in concrete fullness. Which of the various aspects we select to designate the man or the city depends upon the most representative or characteristic experience we have had with them, and also, of course, upon the interest which is at the moment in control of thought or perception. In general, the depth and power of a mind or personality is measured by the variety and subtlety of the forms accessible to it, and by its power to illuminate the whole of the object, which is a complex of many forms. Has there ever been a more eloquent defense of formal variety as grounded in human variety? And shouldn’t we remember, as the Barnes reopens in downtown Philadelphia, that it was these ideas that animated Albert Barnes’s legendary buying sprees in Paris—that pushed him to claim for America Seurat’s Models, Cézanne’s greatest Card Players, the still grievously underappreciated late Renoir pastorals, and Matisse’s Joy of Life? Barnes’s The Art of Painting—I have before me the 1937 Third Edition, published by Harcourt, Brace, and Company in a banal, tan buckram binding—is the text that stands behind this great collection. I am beginning to warm to the physical ugliness of Albert Barnes’s books, which come out of a dirtier and more ambitious America, the America we know from Dreiser’s novels. This is not a book that is meant to adorn the drawing room table in some elegant Main Line home. The Art of Painting is a book that refuses to seduce. Barnes will never let us forget that there is no art without ideas.